It is a very rainy and miserable day here, so I decided to make the kids some biscuits and a hot home-made milo for afternoon tea. 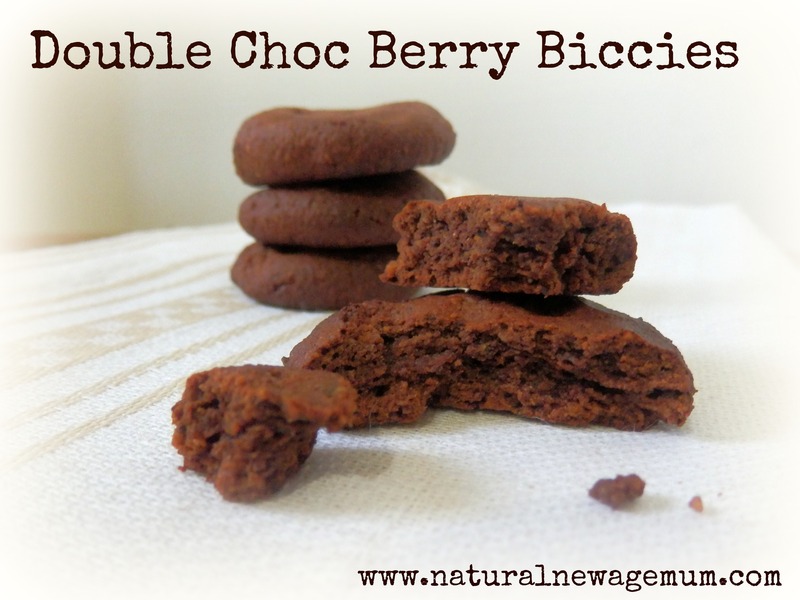 Thinking about this recipe, I played around with some other flavours and came up with these Double Choc Berry Biccies! I was pretty impressed. What a powerhouse little biscuit, chock-full of superfoods! You won’t get that in a Tim Tam! Please check for sweetness. I like the bitey dark chocolate taste, but you might like them sweeter. I know the kids did! Vital stats: gluten-free, grain-free, refined sugar-free, dairy-free, vegetarian. If you have a thermomix, make your almond meal first and then chuck everything else in and whizz. Wet your hands and roll into balls – I made 15. Press down slightly on them. Fling on a baking tray with some baking paper. Bake for 10 minutes or until brown in a 180 degree celsius oven. I think they would also be fab, sandwiched with some paleo salted caramel. I used three of my favourite superfoods in these biccies and you can get them from my affiliate shops. Click on the picture for more info and prices. Are you a fan of choccie biccies? 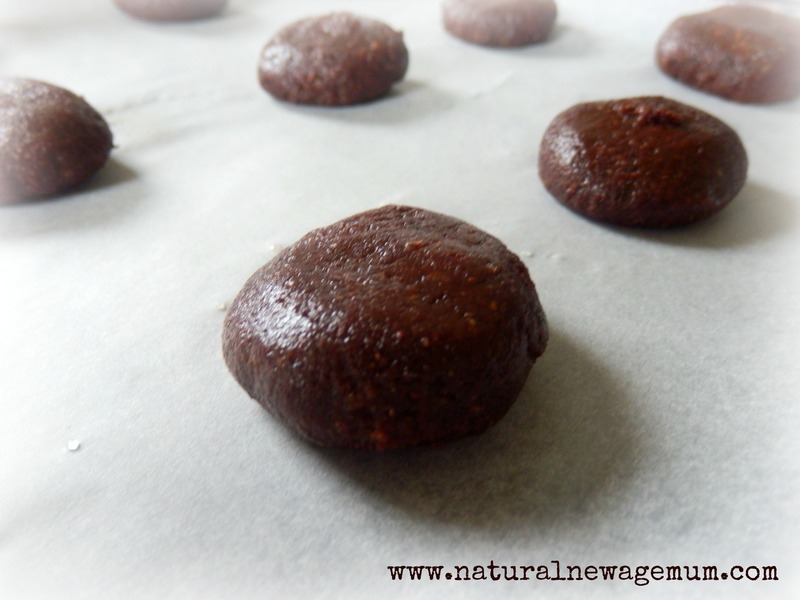 Want more healthy biccy recipes? Try these. yep or even leave it out? These look awesome. I live in a small town and the Superfoods for Kidz isn’t available here. Would have to wait at least a week to get it. Can you recommend an alternative – would it work if I whizzed some craisins or frozen berries in my Thermomix? I would try something in powder form first Cheryl – I think frozen berries would make the mix too wet. I’m wondering if you could use Macca or Inca Inchi powder instead of the crio bro or berry powder. Should work. Hi Sonia, don’t have the Berry Blast. Can you suggest a replacement or just leave out ? If I don’t have crio bru, can I replace it with something? You could try anything I guess – coconut? Maybe just some dessicated coconut? I am trying to think of something that would give you the same texture…. or even cacao nibs if you can get them. thanks Jess – let me know how you go? I will make and share with my family and friends, Entice there taste buds to a healthy change with food! Tried all around town and couldn’t get any powders so just whizzed up 1 Tablespoon of cranberries to replace the 2 Tablespoons of C Berry Powder and the biscuits taste awesome. My nearly 3 scoffed hers and asked for “just 1 more then no more mummy” 🙂 Thanks for sharing the recipe. Oh that’s a great idea Cheryl – so glad she liked them! yum yum yum yum yum! I love a good chocolate biscuit!!!! thanks Yvette… she did good, didn’t she! These are yummy! My 3 year old loved them. I subbed Berry Choc Chunk powder for the Berry C Blast. Thanks for the feedback Carly – good tip for the Berry Choc Chunk… extra chocolatey! They look very melt in your mouth! I don’t have the crio bur or c berry blast but i do have raw cacao and superfoodz berry choc chunk. What do u think about replacing with these 2 ingredients? would i use same amount of cacao as crio? cheers. ok, so really dumb question… is cacao what cocoa is made from? and why add both? is it for taste? What can I use instead of the Almond meal?